What is the difference between functional and class-based React components? React offers two ways to define components: they can be functional or class-based. If you are new to React, you may be wondering what the difference is between them. The React documentation doesn’t clearly explain when and why you would use one or the other, and what the pros and cons of each type are. In this article I will help you understand the difference between functional and class-based components. You will know why you may prefer one over another. What are functional and class-based components? The value returned by the function only depends on values passed in props parameter. That is, given the same props, a functional component always renders the same result. A class-based component is a more complex structure. It is an instance of a class derived from React.Component class. The class must implement a render() member function which returns a React component to be rendered, similar to a return value of a functional component. In a class-based component, props are accessible via this.props. Apart from props, the component rendered from a class-based component can depend on its state. Here is an example of a class-based component which maintains a counter in its state. The counter is incremented every time a user clicks on a button which is rendered inside a component. In addition to a state, class-based components can also have lifecycle methods which fire at specific points of a component lifecycle. Those lifecycle methods can be used to fetch the data from remote servers, create objects, such as timers when the component is mounted (rendered to the DOM for the first time), and free them when a component is unmounted from the DOM, determine if the component should be re-rendered if props are changed, and so on. Class-based components can also have refs to the underlying DOM nodes. Refs may be necessary, for instance, to manage focus in your application for accessibility reasons. Functional components cannot contain refs because they don’t have instances. shouldComponentUpdate and PureComponent are two advanced performance optimisation techniques only available to class-based components. React component re-renders if its props or state change. If that happens very often, that may impact your application’s performance. shouldComponentUpdate is a special lifecycle method. It allows you to skip the re-rendering even if the props or state changed. You may choose to derive your class-based component from React.PureComponent rather than React.Component. In that case React will execute some checks to detect if the state or props changes. If your state or props are very complex objects, that may save you some precious execution time. These two techniques have a potential to improve your application performance. However, they should be applied sparingly because they have a potential to break your application if used in a wrong way. A class-based component can maintain its own state. Class-based components can have lifecycle methods which can be used to perform various actions at specific points of the component lifecycle. Class-based components can have refs to underlying DOM nodes. Class-based components can use shouldComponentUpdate and PureComponent performance optimisation techniques. Or if you plan to use shouldComponentUpdate or PureComponent performance optimisation techniques. then you have to use class-based components just because function components don’t have those features. 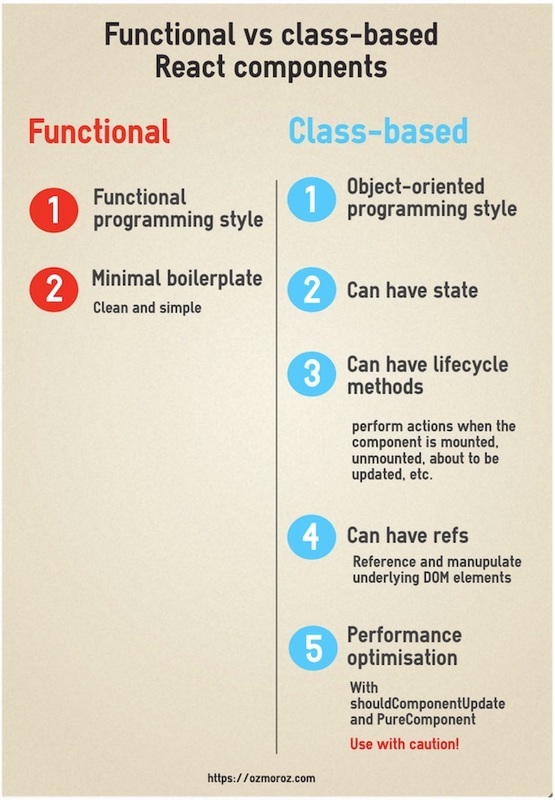 However, If your components do not require state, lifecycle methods, refs or advanced performance optimisation techniques then neither functional nor class-based components provide clear advantage one over another. In that case, it ultimately comes down to your preference or decision of your team. Your project enforces react/prefer-stateless-function ESLint rule which requires you to write functional components whenever possible. You find that you often end up converting functional components to classes when you suddenly need state or lifecycle methods during app changes. You realise that you lose code clarity if you end up with classes here and functions there. That may be important to big teams where it is crucial to work very clean. I agree! Current guidance is: use functional components for simple things, use classes for state/lifecycle (because functional components can’t express it yet). We plan to tackle unification in a year or so, then functional components will be able to do everything. Open this CodeSandbox for an interactive example of the code above. Also, You can access the 100% working source code for this article from my Git repository.